Since the first installment of The Truth Will Set You Free podcast series titled “The Rapture Road,” Vic Batista of Miami’s Calvary Chapel Broward and Nathan Jones of Lamb & Lion Ministries have been teaching through the biblical prophetic book of 1 Thessalonians in a verse-by-verse study. We will now learn Paul’s approach to preaching in 2:10-12. Nathan Jones: Let’s pick up with what the Apostle Paul said in 1 Thessalonians 2:10-12. Vic Batista: Christians are called to walk in the Holy Spirit and be lead by the Holy Spirit. Here in this passage in verse 12, Paul uses that wonderful phrase that “you will walk worthy of God who called you into His own kingdom and glory.” Our spiritual walk is vitally important. Sometimes people focus more on their daily temporal lives than their eternal spiritual lives. Nathan Jones: Exactly! We often find ourselves looking down at the ground rather than up in the sky, so to speak. Vic, as you’re a pastor, when preaching how would you advise people to walk worthy of the Lord? What things must they do then to be thought of by God as walking worthy? Vic Batista: Walk in purity, walk in love, and walk in obedience to the Word of God. Practice these three and you’ll be walking spiritually worthy lives according to God. Nathan Jones: Good advice. Paul was emphasizing that he and his evangelism team behaved likewise as living testimonies. They lived out what he was preaching. Vic Batista: I’m often dismayed when encountering some Christians. When it comes to their understanding of biblical prophecy, they’re very good at sharing a lot of facts about Bible prophecy and about the end times. But, their own personal lives and spiritual walks are in shambles. Nathan Jones: Head knowledge is all well and fine, but unloving Christian behavior really hurts our Christian witness. You mentioned Bible prophecy in particular. We can all probably agree that a number of people who are really into Bible prophecy tend to be judgmental. They can even become very angry when sharing the Word of God. I know their hearts are in the right place because they want to see conversions for Christ and a change in people’s lives, but sadly instead they put off the very people they are witnessing to because of their anger and by being judgmental. God told us that we shouldn’t be judgmental of others, but that we should worry about the 4×4 in our own eye, and not the speck in our brother’s eye. After all, when has anybody ever been led to Christ by someone yelling at and condemning them? When we reach out to people for Christ, instead look at what Paul exemplified. See how he walked: devoutly, justly and blamelessly. They behaved themselves. They exhorted, they comforted, and they treated everyone as by a loving parent. Paul showed that when we approach non-believers, we can’t see them as the enemy, even though they are currently in the enemy’s camp. Think of these lost souls as pre-Christians who are possibly going to become Christians. We need to come to them in love, not judgmental or angry, and not wagging our fingers. We saw how Jesus changed the world by bringing love, not judgment. Sure, He will bring judgment one day against those who will never repent, but vengeance is His alone. Paul actually will get into that a little bit at the very end of the chapter, but for now, how we approach people when we share the Gospel is vitally important. Paul demonstrated that we should behave like Christ. 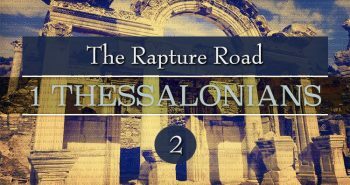 In the ninth part of our travels along the Rapture Road and our verse-by-verse study of 1 Thessalonians, we’ll discover how the Thessalonians responded to Paul’s approach to sharing the Gospel in 2:13-16.